Kelley Osborne, NP | Gastrointestinal Specialists, Inc.
Kelley Osborne is an ANCC board certified family nurse practitioner, as well as an ASMBS certified bariatric nurse. Kelley works at our Wadsworth office, primarily with Dr. Omer Khalid. She received her bachelor’s degree in liberal arts from Virginia Tech and originally worked at GSI as a front desk and medical assistant; an experience that led her to seek her advanced nursing degrees. 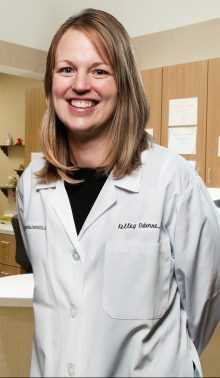 After graduating nursing school in Boston, she spent three years working as a nurse practitioner in the Gastrointestinal Surgery Department at Hospital of University of Pennsylvania and then three years as director for the Sibley Center for Weight Loss Surgery in Washington, D.C.
She was born and raised in Richmond and is excited to be with the practice. Happily married, she is the busy mother of three young children who enjoys gardening and reading in her free time.